The snow is gone and Durham HOG is thinking about riding weather. 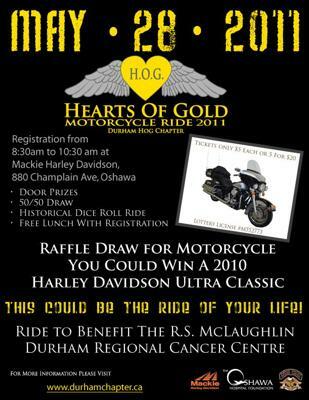 Mark your calendars – our annual Hearts of Gold Ride is scheduled for May 28, 2011 in Oshawa. It is promised to be a great event with proceeds going to benefit the R.S. McLaughlin Durham Regional Cancer Centre. We have topped ourselves again – this year we will have a draw to win a 2010 Harley-Davidson Ultra Classic. We would ask that you please notify your Members of our ride and we would be grateful if you could add the attached poster into your Newsletter/Website/Calendar of Events. If you have any questions – please do not hesitate to contact me. Thanks for you time – and we hope to see you all at our Ride in May.